Access to a free e-learning Introduction to Autism package. A certificate recognising your Autism Ambassador appointment. Useful links to further information, organisations and professionals for you to share. The use of the Autism Ambassador logo. This permission to be reviewed each year with the submission of the self-assessment evaluation. Membership of a Facebook group to support networking, collaborative working, sharing of ideas and celebrating success. Access to an annual conference to support Ambassadors to continue to develop their knowledge. A one-hour autism awareness presentation is available for you to deliver to your colleagues in your workplace. Online support from members of the Hampshire Autism Partnership Board. Autism, this could be perhaps by raising awareness or making a change to your environment. Think about…. the things that a person with Autism may find difficult or stressful. You will probably find that everyone may benefit from the changes! 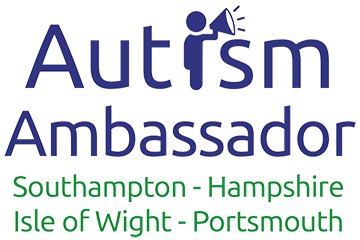 This site is maintained on behalf of the Autism Ambassador Scheme by the South Hampshire Branch of the National Autistic Society.